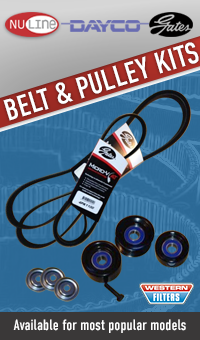 Brand new Nuline pulleys and ribbed serpentine belt. Great for high performance or just as an upgrade. Please note product image may not represent actual kit. All items are brand new in box and are covered by warranty for workmanship. All metal superior quality pulleys !!! Kits include High Quality Belts from the industry leading brands such as; Bando, Dayco and Gates. Heavy duty all metal construction offers far greater wear resistance. Nylon cages for quiet running and extended bearing life. ETK bearing grease for higher and lower operating temperatures. All bearings have labyrinth type seals for improved seal performance. Tight tolerances to ensure smooth operation and extended life. Nuline engine pulleys are manufactured from metal for far greater strength and wear resistance when exposed to environmental factors. All ball bearings are manufactured from high quality bearing steel using a nylon cage and using ETK grease for quiet running and maximum bearing life. In independent testing by a NATA accredited laboratory Nuline bearings equalled or exceed the values by OEM bearings in all areas.